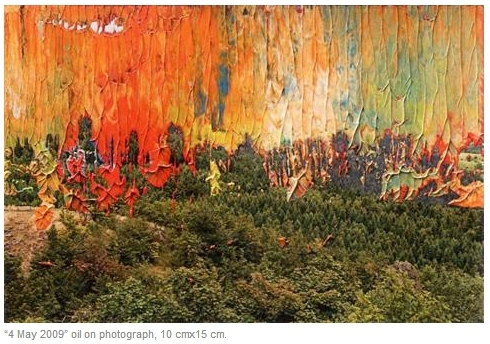 Do our brains naturally prefer literal photographs over abstract art? Does that set up a fight for our attention? As we saw with the Munch blog post last week, painters have been in conversation with photography since the invention of the camera. Some have taken photography into their art practice, while others have worked to create new forms of art that transcend the literal and challenge how we see. Gerhard Richter, one of the most influential artists in the last half of a century, has been a key contributor to this ongoing dialogue. Since the 1980’s, Richter has made series of small scale works in which he smears paint over photographs. One of these paintings, Evening (14.9.98), was recently featured in our Slow Art Day Tumblr. The tactility of the paint and the collision of surface and representation make them perfect pieces to look at slowly. Browse the Beirut show and read Quilty’s review to enter into this lively conversation between photography and painting. Best of all, visit Richter’s website to see for yourself his whole collection of overpainted photographs. I love Richter’s work, and how he makes use of different media. I especially love the juxtaposition of the two media here, with the drama of the painted colors on the otherwise mundane background. I love “4 May 2009” – it really explicates well the argument that the contrasting elements are fighting for attention from the viewer. However, I find this especially fantastic because the painted section covers the span of the sky, and appears to be a particularly vibrant and entirely plausible sunset! The mediums may be in contrast, but they still work together. The more I look at this piece, the harder it is for me to discern if the paint is layered over the photograph or if the photograph is layered over the paint. This illusionistic quality adds another dimension to the piece that plays with the mind’s judgement. I really enjoy the attention this piece beckons from the mind to make sense of the contrasting modes of representation. Maggie – great comment. He does make this pictures come alive in new ways doesn’t he? Karen – agreed. Perhaps we could say that the two media are both complementing and battling. Adrienne – doesn’t this piece really almost force a slow practice? I find myself continually drawn back to his work. I hope that in 2013 a host can select some of Richter’s work for one of the venues. Sign me up for a Slow Art Day event that views Richter’s work! I’m in! Dana, I love the enthusiasm! A Slow Art Day event looking at the Museum Visit overpainted photograph series would be especially interesting – museum goers looking at an artist’s look at museum goers. I definitely agree with two of the points made above. Firstly, I feel that if I were to look at this piece from far away in a museum, I would think it is a landscape portrait of a sunset. However, upon detecting the brushstrokes, the feeling I get is that both parts are competing against one another and it makes me wonder what is to be found beneath that layer of paint.